With the trajectory of military operations, the demand for cyber operations (including operations and general IT) is slated to increase significantly. To help meet the demand for cyber training in the Air Force, the service’s 39th Information Operations Squadron stood up a detachment at Joint Base San Antonio – Lackland, which is also headquarters to 24th Air Force/Air Forces Cyber. While a large portion of the Air Force’s intermediate and foundational cyber training is done at Hurlburt Field, Florida, the 39th IOS home, the detachment in San Antonio, Texas, served as a “plus up” to the cyber mission force, which was created in 2012. As the Air Force expects cyber to play a critical role in future conflicts, schools like the 39th Information Operations Squadron become increasingly important in preparing airmen for that battlespace. Even with the cyber mission force reaching a critical U.S. Cyber Command-dictated staffing milestone in the spring, officials said the 39th IOS detachment in San Antonio will continue to grow. Part of the reason is the benefit of co-locating and integrating the training community with operators. “We work hand in hand with the operations squadrons in order to build that curriculum, maintain it, update it and present it to the students so they can be value-added day one when they get to their ops squadron,” Lt. Col. Angela Waters, the squadron’s commander, told Fifth Domain during an interview at the 39th IOS headquarters. 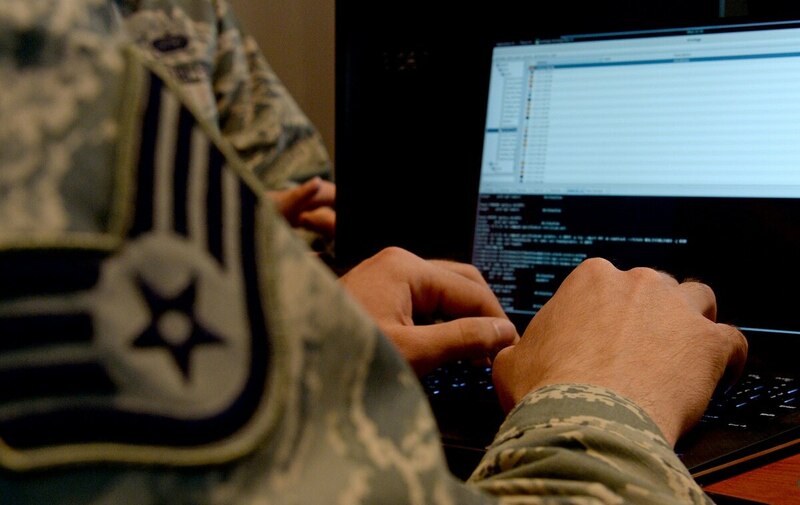 The detachment has allowed the Air Force to “keep pace with the ever-increasing cyberspace operator requirements outside of CMF,” Maj. Gen. Christopher Weggeman, commander of 24th Air Force, wrote in prepared testimony before the Senate Armed Services cyber subcommittee in March. While this integration of training and operations is an added benefit, Waters said the detachment was initially stood up nearly four years ago because there wasn’t enough room at the main headquarters to train everyone. The 39th IOS is getting a new building that will house more classrooms and server space, but the groundbreaking just took place earlier this year despite that project having been on the books for a while. The demand for cyber training has increased substantially in recent years, so much so that the 39th Information Operations Squadron had to build another building. Moreover, while 39th IOS headquarters are growing, they still need to spread training for certain weapon systems throughout the force. Traditional training units for air platforms in the Air Force regularly require a single squadron or multiple squadrons for a single weapon system. By comparison, 39th IOS is covering most of the cyber weapon systems in a single schoolhouse, Waters said. Currently, the Air Force only offers one course per cyber weapon system, Waters said. Compare this to what typically occurs from an air platform perspective. Usually, the Air Force will hold an initial course to teach how to fly the system; a course to serve as a refresher if a pilot held a staff job for several years and is now going to fly again; and then a senior leader course that will provide information on all the systems at a wing that an incoming commander will be overseeing. Those three courses do not exist yet for each individual cyber weapon system, Waters said. “As you see it, we as a squadron/detachment pair are covering down on all of those requirements right now,” she added. While there are a series of courses that are shared between the detachment and the headquarters, there are also two classes exclusively taught at the detachment. Waters said in the future the goal is to move courses back and forth as necessary.